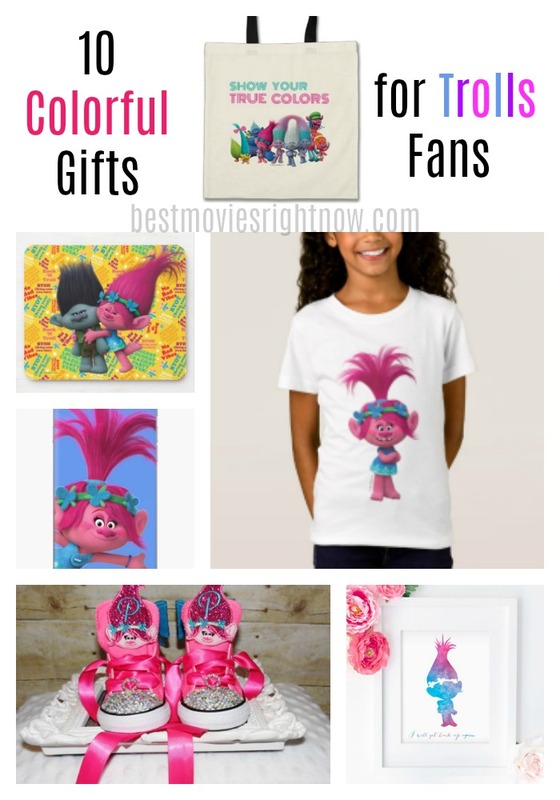 Are you looking for Trolls gifts for someone who loves the Trolls movie? I’ve created a list of Troll gift ideas at every price point. Hand-curated by me. Trolls are small creatures who live in an almost perpetual state of happiness, singing, dancing and hugging all day. However, they are discovered by the Bergens, large miserable creatures, who can feel happy only after eating a Troll. The film follows the two trolls who go on a quest to save their village from destruction by the Bergens. The main characters are Poppy, the princess and later queen of the Trolls and Branch, a paranoid, disgruntled Troll survivalist. Although the movie is not a musical, the soundtrack is sung by the Trolls during the movie. My favorite songs were Can’t Stop the Feeling and a remake of True Colors . These Trolls movie gifts are so bright and cheerful, any fan will love them. 1. 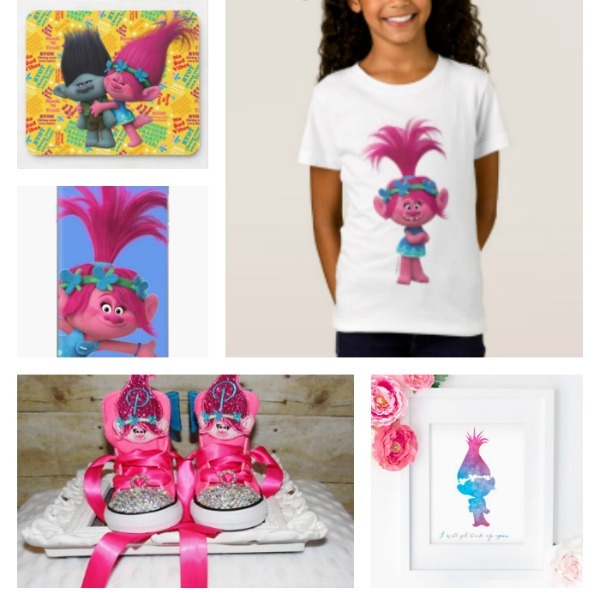 Trolls Headband – Everyone loves Poppy’s hair from the movie. Now your princess can have Troll hair, too with this cute headband. 2. Trolls Shoes – Add some sparkle to your little sweetie’s toes with these precious Poppy Shoes! Authentic Converse, high- or low-tops can be made to match any outfit. Embroidery of the character of choice for the tongue of the shoe, and additional glitter name on side of the shoe. The toe of the shoe is covered in shiny Swarovski crystals applied one by one, by hand with the strongest adhesive available! 3. Trolls Costume – Inspired by Poppy from Trolls! Perfect for Trolls birthday gifts or Halloween. Features a 2pc set: ribbon trimmed tutu and a personalized top. This Trolls gifts for girls is my favorite on the list. Too cute! 4. Trolls T-shirt – Bubbly Princess Poppy is featured in full color on this white t-shirt. It will make you happy just looking at it. 5. Trolls Vinyl for Phone Case – Poppy from Dreamwork’s Trolls is featured on this vinyl decal for iPhone Cases. 6. Trolls Mouse Pad – See your favorite Trolls characters – Poppy & Branch – with this “No Bad Vibes” Mouse Pad. 7. Trolls Tote Bag – Welcome to Troll Town where love is always in the hair, cupcakes with a side of rainbows is an attitude (and snack), and pants are optional – especially if you’re wearing glitter. This tote bag ensures you always show your true colors. 9. Trolls Water Bottle – Your kids will think drinking water is fun with this “Hugest” water bottle printed with Trolls artwork. 10. Trolls Hair Bows – Another cute way to replicate Poppy’s hair from the movie. Now your princess can have Troll hair, too with these cute hair bows. These are super cute Troll gifts! Don’t forget that these make perfect Trolls Christmas gifts! What did you think of this Trolls gift ideas list?